It is rumoured that when he was a delinquent junior player, Nick Fenton-Wells was inclined to pack on the pounds, in the old vernacular. Whatever brought about the transformation (perhaps his famous uncle gave him a tongue lashing? ); Nick went from Fatcakes to Fame in a rugby jiffy. Well, there was a lot of sweat and blood spilled before he came to be recognized as the latest in a long line of Ikey rugby captains to be elevated to that special status which men like Tom Hugo-Hamman, Basil Bey, Gus Enderstein and a few others attained. 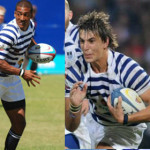 Outstanding players all, but first and foremost, Ikey captains who were exceptional leaders, motivators and characters. The players would hobble, bare foot on broken glass for these men, to keep the name of the greatest rugby club in the world resounding throughout the rugby world. This does not in any way impugn the reputation of other UCT rugby captains, but some were so famous as Springboks or W.P players that their captaincy was different, not less. Nick was that sort of captain who by sheer will and example 'persuaded' his players to go the extra mile. Fatcakes has come a long way. He is a classic example of a UCT man who has gone from rugby player to a credit to his Alma Mater whatever path he treads in life. 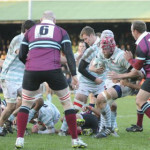 Nick Fenton-Wells is currently playing as a Flanker for the Bedford Blues in the RFU Championship. After a very successful two-year loan period from Saracens, the sturdy number 8 was made a permanent feature of Goldington Road and announced as the new captain rewarding his contribution to the team. How are you enjoying life in the United Kingdom? I am really enjoying it, I’ve started my last year of my MBA (part-time through Durham University Business School), I have a contract at Bedford Blues until the end of 2016/2017 and I am currently living with my girlfriend and a 6 month old Sprocker puppy (cross between a springer and cocker spaniel) in a beautiful town 25 minutes north of London. What does a typical week and match day entail? We train 3 days a week, from 2pm-7pm in the evening and this is generally Monday, Tuesday and Thursday, depending on the day of the fixture, occasionally it is a Friday night or Sunday fixture, which changes our training days. Sunday is an inidividual recovery day. A typical training day starts with gym at 2pm, physio and analysis between 3pm-4.30pm, Units from 4.30-5pm, team meeting at 5pm, training from 5.30pm – 7pm (length of team session varies depending on day of the week too). What has been the highlight of your time with The Bedford Blues so far? What advice would you give to anybody wanting to play rugby professionally in the United Kingdom? It’s not always easy going to the top clubs to build your rugby career. The competition is fierce and if you miss your one opportunity, it can impact on your career significantly. Ensure that when that opportunity arises take it with both hands. Go to a club where you can enjoy longevity, a club that has your best interests at heart (not only rugby) and has a good club culture. A holistic rugby club does not only view you as an asset, but builds you for life after rugby too. Although I missed my opportunity at Saracens, they gave me the opportunity to build my career outside of rugby by pushing me to do my MBA. Bedford Blues build the individual and play rugby for the love of the game. It is not a job, but a passion. In the profesisonal era it has become too much about a job. Many great rugby players that I know lost the passion for the game when they turned professional. Some say that they were do not possess the strength of mind for it, but I disagree. These are men who have featured in heineken cup finals, played for top clubs in europe, but they are rugby romantics and many clubs and national sides don’t play rugby for the romance. Do you follow the UCT Ikey Tigers and the Club? Yes, I am subscribed to the Ikey Tigers database and I am in regular contact with John Le Roux (He’s taller than me and you) and Neil Macdonald and I went to watch the Ikeys play in the world universities competition hosted at Oxford, where I had a chance to catch up with former team mates, coaches, physios and my former mentors! What do you miss most about UCT rugby? At UCT, we played for the love of the game, for the love of each other and to become better people. Our goals were different, yes we wanted to win, but we wanted to win playing an attractive style of rugby that we all enjoyed. That is the great thing about Bedford Blues. They have a similar outlook to how we approach the game, albeit still slightly more structured. And of course my mates. I miss my mates from all my years at UCT rugby. From 2006 until 2011 I made friends that will be great mates for life.